I've been showing you cards made with my favourite hostess sets this week. These are sets that you earn for free when you host a qualifying party or place an order for £150 or more. You also get to choose one when you join my Stampers Six club (see details above). A free stamp set? Sounds great doesn't it? But that isn't all! You also get to choose free items from the catalogues! I combined two stamps from the set to make the fruity image. I have to admit to being the world's worst colourer but I can just about get away with it... I think... No - please don't burst my happy bubble! Cut a piece of Whisper White card stock 13.5 cm x 8 cm. 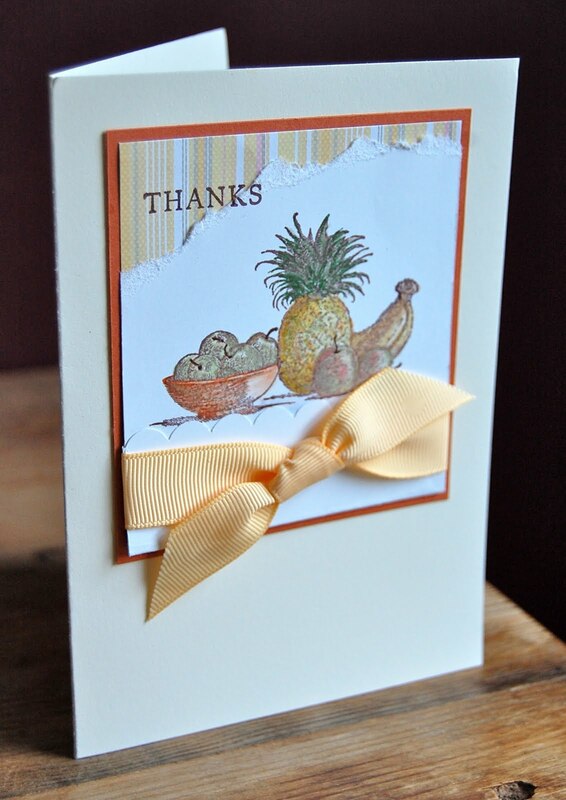 Stamp the two fruity images in the top half of the card stock using Chocolate Chip ink. Colour the resulting single image with markers and a blender pen. Scallop the bottom of the card stock and fold it up so that the scallops touch the bottom of the coloured image. Give it a nice sharp crease with a bone folder and glue the fold closed. Tear the top of the card stock being careful not to tear the picture. Mount this onto striped designer paper and tie grosgrain ribbon round it in a flat knot. Stamp a sentiment across the dp and the torn card stock. Matt onto Really Rust card stock and adhere to a Very Vanilla card base. I dedicate my card today to all my blog readers. I love it that you come to visit, leave me comments and sometimes decide to follow my blog and I want you to know that each one of you is very much appreciated. Beautiful card Vicky. Your colours are perfect, I love the torn effect with just a peek at the patterned DP. I have to disagree about the colouring though. I am definately the worlds worst which is why I seldom do images. Gorgeous card, love that stamp set. I like how you tore the edge of the paper to reveal the stripe. Very nice still life image.